This exhibition ran between the 7 June and 1 September 2013. 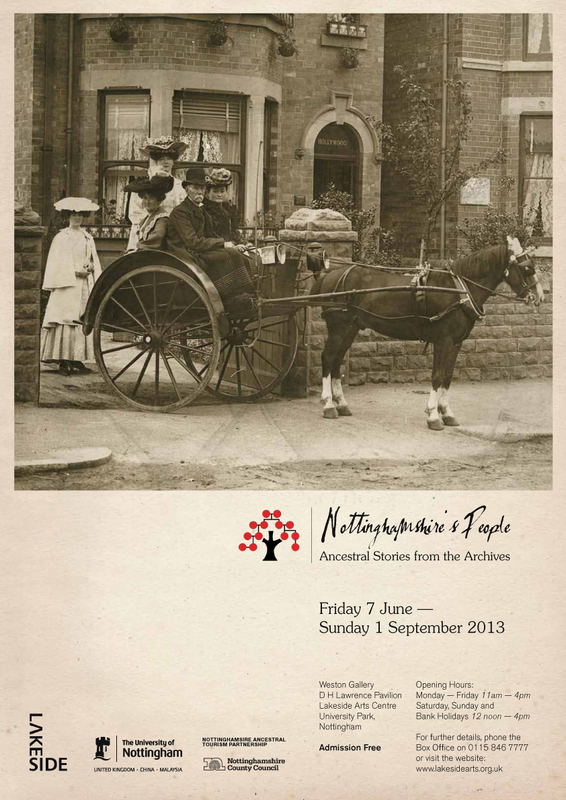 'Nottinghamshire's People' was jointly curated by staff from Nottinghamshire Archives and Manuscripts and Special Collections at The University of Nottingham. Tracing ancestors has proved a fascinating challenge for generations. Some researchers have sought evidence to establish a claim to a title, but increasing numbers pursue family history as a hobby, and want to know more about the lives and times of their forebears. Publications and television programmes such as 'Who Do You Think You Are?' show how a family’s past experience can powerfully resonate with an individual’s life today. Whether your ancestors were humble agricultural labourers, local dignitaries or incorrigible criminals, they all have a story to tell. Family historians today can draw on rich internet resources, but ‘Nottinghamshire’s People: Ancestral Stories from the Archives’ showcased the original documents that provide the evidence for ancestral research. Through church records, private papers, maps, wills and many other sources, it uncovered the rich world that lies beyond the indexes of census and birth, marriage and death records. Listen to audio recordings of the lunchtime talks given by external speakers that accompanied the exhibition. Click on the image above to see a larger version of the poster. The exhibition boards which were displayed in the Weston Gallery are available to download in pdf format. Most of the exhibition boards were 'case studies' of notable Nottinghamshire residents, showing the range of documents that could be used to build up a picture of a person's life. The final board explored what resources are not available to researchers online. Unfortunately it is not possible to display representations of the original archive material which featured in the exhibition cases. Wonderful collection thank you for a glimpse. Beautifully presented and v. interesting. My children aged 12 and 8 loved being in here. Fascinating exhibition – well put together. Let us know your comments on our physical and online exhibitions. Follow @msslakeside Follow us on Twitter for the latest news and images from Manuscripts and Special Collections Exhibitions at Weston Gallery Lakeside Arts Centre.